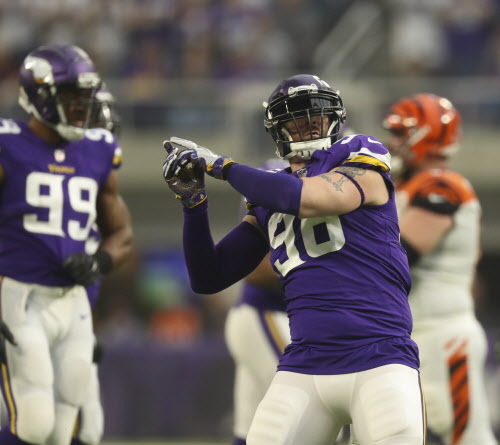 Defensive end Brian Robison, who’s been with the Vikings since he was drafted in 2007, said the extra money wasn’t worth him leaving what he has in Minnesota during what could be his final season. When Vikings defensive end Brian Robison tweeted on May 14 that he’d be back for a 12th season in Minnesota, it stood to reason the 35-year-old, who had no guaranteed money left in his contract, had accepted a pay cut to return for 2018. As it turns out, Robison agreed to a reduction that saved the Vikings $2.3825 million in cap space. The defensive end, who was scheduled to earn up to $3.5 million in 2018, will instead play for the veteran minimum base salary of $1.015 million, along with a $90,000 workout bonus. While it’s possible the Vikings could still cut Robison before the 2018 season, it seems far less likely they would do so, given the fact he still had four sacks in a part-time role last season and would still bring value to the roster both as a rotational pass rusher and a mentor for younger players. Robison said he thought about being released by the Vikings to test the open market. After reworking Robison’s contract, the Vikings have $17.136 million in salary cap space remaining for the 2018 league year. After restructuring his contract for the first time last year, Robison said he intended to retire after playing out the final year of his deal in 2018. It remains to be seen whether he’d consider returning in 2019, either on a new deal with the Vikings or another team. But if 2018 is the final year in Minnesota for the popular player, it will grant him a season in the team’s new practice facility and one more chance to chase a Super Bowl ring with the Vikings. Few players were more outspoken about what the team’s 2017 playoff run meant to them than Robison, who hadn’t played in the NFC Championship Game since 2009. And after the Vikings’ 38-7 loss to the Eagles, few players were more visibly upset in the postgame locker room than the typically affable Robison. He’ll get the chance to rewrite the ending to his career in Minnesota, albeit at a reduced salary. That tradeoff, Robison decided, was worth it.